U.S.: Hezbollah part of Assad's "killing machine"
UNITED NATIONS The United States said Monday that Lebanon's Hezbollah militia is stepping up support for the Syrian government and has become part of President Bashar Assad's "killing machine." U.S. Ambassador Susan Rice told the U.N. Security Council's monthly meeting on the Mideast that Hezbollah leaders are also continuing to plot new measures with Iran to keep Assad in power. Rice's comments - and those of Israel's U.N. Ambassador Ron Prosor - gave the clearest indication that Hezbollah, which fought a war against Israel in 2006 and is a major political and military force in Lebanon, is sending an increasing number of fighters to help the embattled Syrian regime. Watch: Are Islamist militants taking over anti-Assad rebellion in Syria? Syria's ruling Alawite minority is an offshoot of Shiite Islam and has had close ties to Iran and Hezbollah which are Shiite-dominated. Assad has long helped Iran aid Hezbollah and Hamas, which controls the Gaza Strip, in destabilizing Lebanon and threatening Israel's security and U.S. interests in the Middle East. The U.S. ambassador accused Hezbollah's leader, Sheik Hassan Nasrallah, of being two-faced about his claims that he is promoting Lebanon's interests. "Hezbollah's active and growing support for Assad's war exposes Hassan Nasrallah's claims of promoting Lebanon's national interest as nothing more than a deadly form of deception," Rice said. "The group's leaders may try to change the subject by invoking hollow rhetoric about so-called resistance, but the truth is plain to see: Nasrallah's fighters are now part of Assad's killing machine and Hezbollah's leaders continue to plot with Iran new measures to prop up a murderous and desperate dictator," she said. 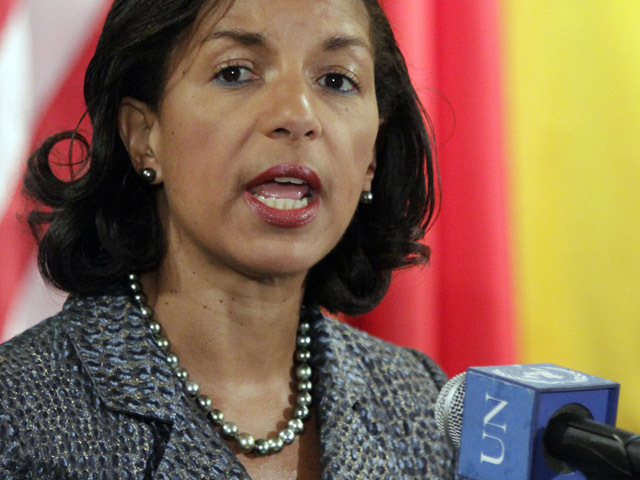 Rice said the United States is encouraging the international community "to counter Hezbollah's terrorist activity and do more to expose Hezbollah's deepening involvement in Assad's war." Israel's ambassador Prosor said Nasrallah claims he needs a private army with advanced missiles to defend Lebanon against the Jewish state. "Today we see that Hezbollah's army is far more preoccupied with butchering their Arab brothers and sisters in Syria," Prosor said. He said Nasrallah and Iranian President Mahmoud Ahmadinejad form a "trio of terror" with Assad, "offering the tyrant of Damascus guidance on how to butcher the Syrian people more efficiently." The U.S. ambassador said the 19-month Syrian war now poses a challenge to all of the Mideast country's neighbors, including Lebanon which has experienced cross-border attacks and an influx of Syrian refugees. She commended the Lebanese government and armed forces "for maintaining stability and law and order at this critical juncture" and welcomed efforts by Lebanese President Michel Suleiman and others to promote dialogue including on disarmament of illegal militias as demanded by the U.N. Security Council. Many speakers at the day-long council meeting mentioned the escalating casualty toll in Syria - now estimated by activists at over 30,000 - and the divided council's failure to take action to halt it, but much of the focus was on the decades-old Israeli-Palestinian conflict. U.N. political chief Jeffrey Feltman told the council that it should be concerned at the failure of Israel and the Palestinians to take meaningful steps to restart stalled negotiations on key issues to achieve the goal of two states living side by side in peace, stressing that this must remain the highest priority. "We fear, however, that the door for such a solution may be closing before our eyes," he said.